Before this recipe I had never made cheesecake before, and was always kind of under the impression that it would be difficult. It was actually surprisingly easy! 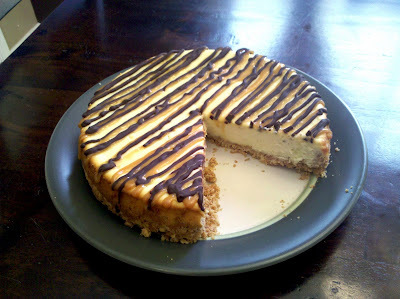 The hardest part was waiting for it to cool before eating it 🙂 I love this recipe because not only is the cheesecake so yummy and smooth, but instead of graham cracker crust, this cheesecake has a vanilla wafer crust which gives the whole cake just a little extra yummy flavor. In a small bowl, combine wafer crumbs and butter. Press onto the bottom and 1 1/2 inches up the sides of an ungreased 9-inch springform pan. Place on a baking sheet. Bake at 400 degree for 10 minutes. Place pan on a wire rack to cool. Reduce the heat to 350 degrees. In a large mixing bowl, beat cream cheese until smooth. Combine the sugar and flour; add to cream cheese and mix well. Add eggs; beat on low speed just until combined. Stir in cream and vanilla. Pour into crust. Return pan to a baking sheet. Bake for 40-45 minutes or until center is almost set. Cool pan on a wire rack for 10 minutes. Carefully run a knife around edge of pan to loosen (don’t skip this step because it will prevent the cheesecake from cracking as it cools); cool 1 hour longer. Refrigerate until completely cooled. In a small saucepan, melt caramels with cream over medium heat, stirring constantly. In another saucepan, melt the chocolate chips and butter with cream over low heat, stirring until smooth. Drizzle caramel and chocolate toppings over cheesecake. Refrigerate overnight. Remove sides of pan. Garnish with whipped cream and pecans if desired. Refrigerate leftovers.